A Tennessee retirement timber home offers room to roam. When retirement beckoned, Jack and Renee Martin bought a lot in a subdivision located along the Tennessee River and recognized that such an idyllic setting deserved a special kind of dwelling. 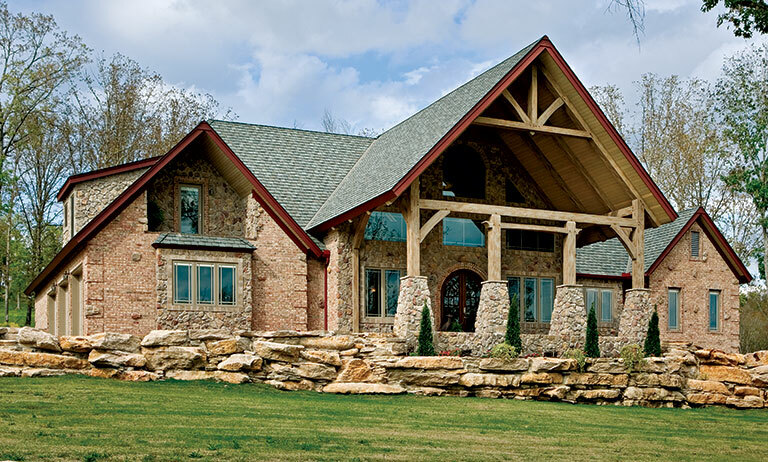 They felt a timber-frame home would be perfect and found exactly what they were looking for after visiting Pioneer Log Systems of Kingston Springs, Tennessee. A neighbor, architect Rick Ray of Creative Home Designs, helped them draw plans for the home. After Pioneer’s crew set the frame, Jack and Renee did a lot of the work themselves, aided by friends and tradespeople who became their friends because of this project. “We worked on the home whenever we could, and it took so long that everyone involved became like family,” Renee notes. The poplar frame stands higher than most because the Martins decided to leave the timbers their full length. As a result, the ceiling ended up higher than planned, and what was intended to be a simple loft offered enough space for several upper rooms. Because of their sloping site, the home also has a spacious walkout basement. In all, the Martins say they can sleep 11 people comfortably. 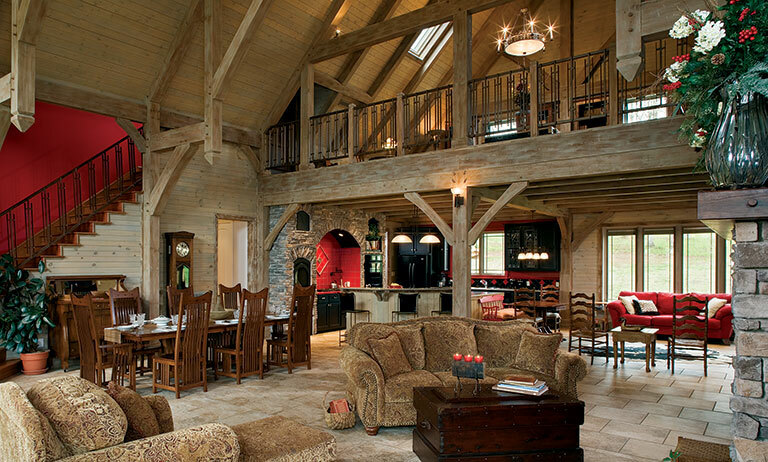 Elaborate timber trusses characterize the 40-by-65-foot great room, shown here looking from the kitchen toward the wall of windows that overlook the Tennessee River. The Pella windows and glass doors do more than just showcase the view. They also let in plenty of natural light and provide a counterpoint to the tall rafter ceilings. The Martins chose Yukon Trail ceramic tile by Ragno for their flooring and left it uncovered to emphasize the room’s openness. 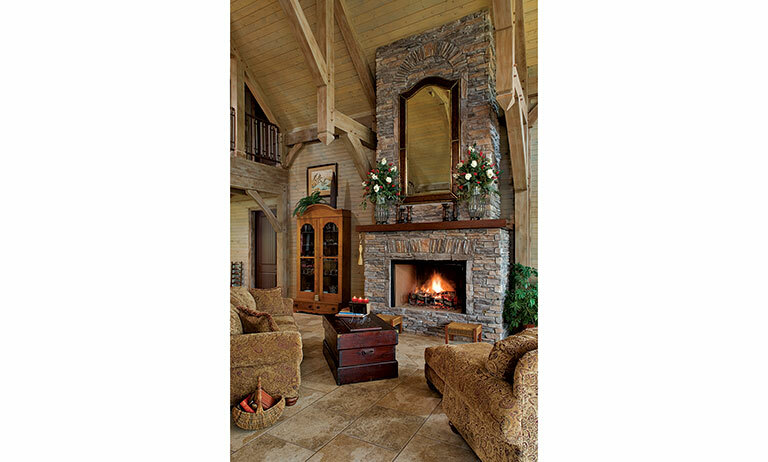 The towering fireplace is the focal point of the living room area of the great room. Built by mason Paul Wheat using Centurion-made Kentucky Ledgestone Veneer, it features a cherry mantel from across the river that Jack sawed and planed. Tile floors throughout the home’s main level radiate warmth from the in-floor heating system, which is run by just one 50-gallon Polaris water heater. 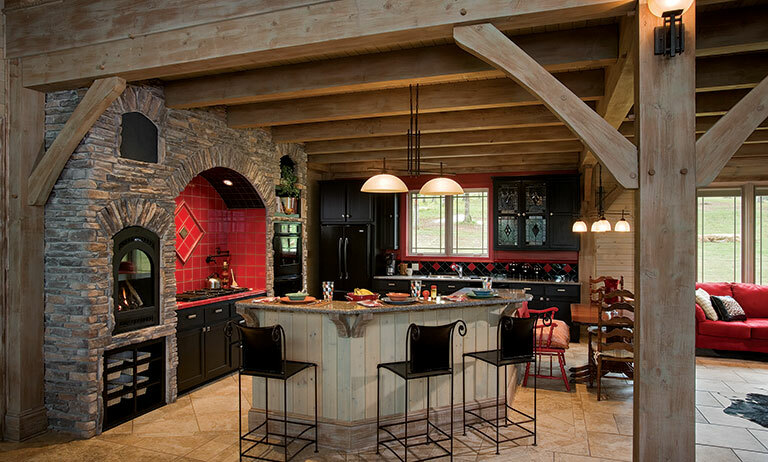 A vivid red tile niche set among a sturdy stone oven wall creates a captivating setting in the kitchen, which is visually distinguished from the rest of the great room by the timber-beam ceiling. Besides its striking appearance, the kitchen functions as an efficient work center, featuring an array of up-to-date appliances. It also benefits from the light it shares with the rest of the room. 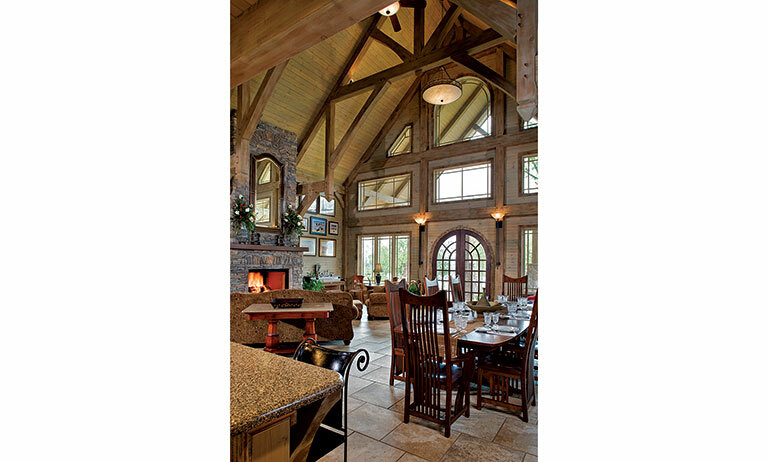 The expansive great room epitomizes the openness that attracted home-owners Jack and Renee Martin to a timber-frame home. 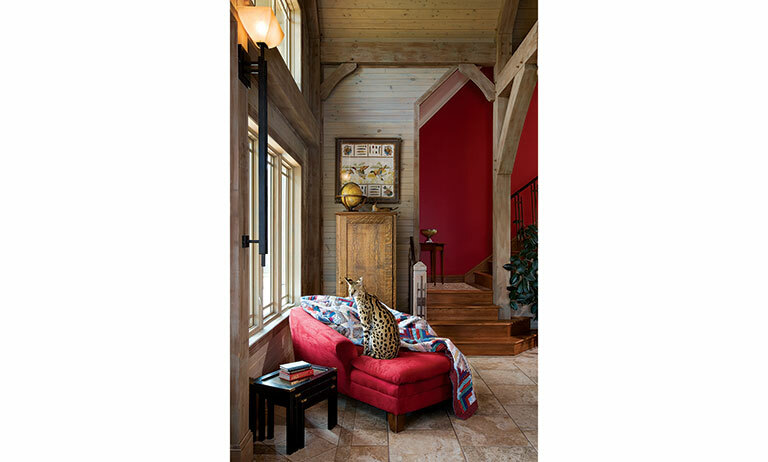 A plush upholstered sofa and chair soften the ceramic tile floor and the poplar timbers. Embellished pendants on the frame interpose visual interest, as does the wrought-iron railing that spans the loft. Before moving in, Renee spent four years shopping for new furniture, which she mixed with family heirlooms and pieces from their previous home. “It was nice to be able to shop for the house over time rather than in a hurry once it was built,” Renee says. The first-floor master bedroom, located in one of the home’s conventionally built wings, is the epitome of comfort. Though lacking timbers, the room achieves distinction with a molded ceiling. Renee found the slate for the gas fireplace on a shopping trip to Alabama, where it had made its way to an architectural salvage place from an 1860 brownstone in Philadelphia. The master bath is roomy and comfortable, and the unadorned windows offer a relaxing view than enhances relaxation in the Duraflo whirlpool tub. Jack did all the home’s electrical and plumbing, as well as the trim work. The open layout provides room to roam for Sammy, the Martins’ African Serval cat, which reaches a top speed of 30 mph but, like most cats, prefers naps. Sammy’s favorite spot is at the foot of the stairs on his own fainting couch. 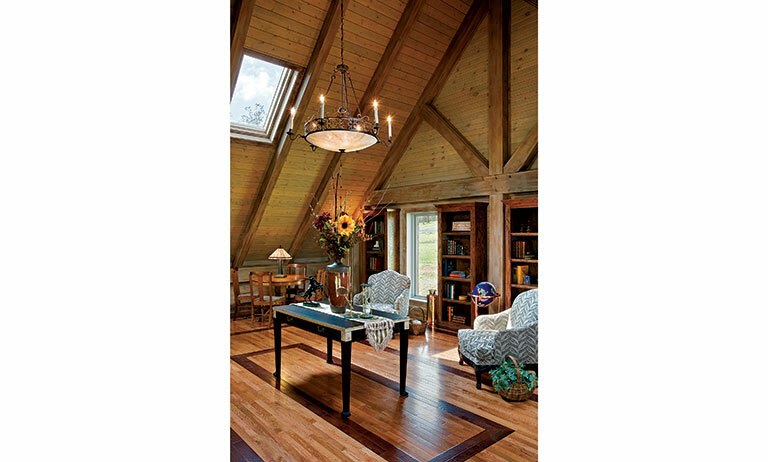 The loft enjoys its own cathedral ceiling, with timber rafters and a king-post end truss. Renee is especially fond of this bonus space not only because it’s off by itself, but also because she likes to play cards with her friends and can leave the card tables set up permanently for as many as eight to play whenever they drop by. When not hosting card games, the Martins use the space as their library.